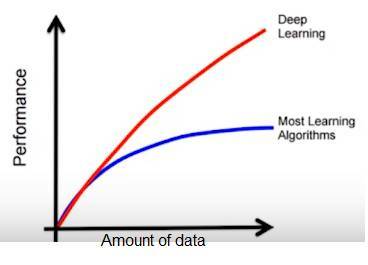 This page covers advantages and disadvantages of Deep Learning. It mentions Deep Learning advantages or benefits and Deep Learning disadvantages or drawbacks. • Machine Learning extracts the features of images such as corners and edges in order to create models of the various objects. It later uses these models to identify the objects. Machine learning does not require high performance processors and more data. • Deep Learning is subtype of machine learning. Deep learning is a machine learning technique which learns features and tasks directly from data. The data can be images, text files or sound. The figure-1 depicts processes followed to identify the object in both machine learning and deep learning. Deep Learning does not require feature extraction manually and takes images directly as input. It requires high performance GPUs and lots of data. Feature extraction and classification are carried out by deep learning algorithms known as convolutional neural network (CNN). CNN takes care of feature extraction as well as classification based on multiple images. Performance of deep learning algorithms increases when amount of data increases. In contrast, performance of other learning algorithms decreases when amount of data increases. The same has been shown in the figure-2. 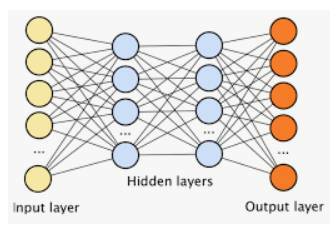 An artificial neural network contains hidden layers between input layers and output layers. Here artificial neurons take set of weighted inputs and produce an output using activation function or algorithm. Traditional neural network contains two or more hidden layers. Deep learning contains many such hidden layers (usually 150) in such neural network. Hence the name "deep" used for such networks. The same has been shown in the figure-3 below. Following are some of the applications of deep learning which have pioneered its development. ➨Features are automatically deduced and optimally tuned for desired outcome. Features are not required to be extracted ahead of time. This avoids time consuming machine learning techniques. ➨Robustness to natural variations in the data is automatically learned. ➨The same neural network based approach can be applied to many different applications and data types. ➨Massive parallel computations can be performed using GPUs and are scalable for large volumes of data. Moreover it delivers better performance results when amount of data are huge. ➨The deep learning architecture is flexible to be adapted to new problems in the future. ➨It requires very large amount of data in order to perform better than other techniques. ➨It is extremely expensive to train due to complex data models. Moreover deep learning requires expensive GPUs and hundreds of machines. This increases cost to the users. ➨There is no standard theory to guide you in selecting right deep learning tools as it requires knowledge of topology, training method and other parameters. As a result it is difficult to be adopted by less skilled people. ➨It is not easy to comprehend output based on mere learning and requires classifiers to do so. Convolutional neural network based algorithms perform such tasks.